The fourth annual Pink Honor Roll induction ceremony took place on August 12 on board a Sunset Cruise around the New York Harbor, courtesy of Statue Cruises. Guests enjoyed a delicious meal on the ferry catered by Chef & Company, drank a sparkling rose courtesy of Lucia Wines, and enjoyed the scenery, music and dancing on board the good ship John James Audubon. 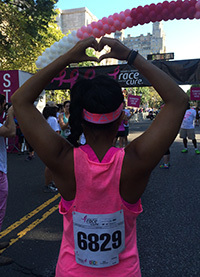 In honor of Komen Greater NYC’s 20th anniversary and in anticipation of the upcoming 20th annual Komen NYC Race for the Cure, this year’s Pink Honor Roll was increased to the top 200 fundraisers and the captains of the top 20 teams from the 2009 Komen NYC Race for the Cure. Between the teams and the individuals, this year’s Pink Honor Roll raised $2.15 million of the $5.21 million fundraising total for the 2009 Race an incredible achievement. If you are publishing this photo you must include a photo credit to Sean Friedman. Download a High Res version of this photo (right-click on this link and 'Save'). Return to Komen Affiliate Events.